For a small project I created a WebApp utility to generate number lists. With some small adaptions I decided to turn it into a WebApp and make it available for everyone. On the startscreen pin the app to your home screen to take full advantage of your mobile screen because it removes the address and footer bar after you start your pinned WebApp. ( gives a native App feeling). It will work also on HTML 5 supported browsers like Safari. 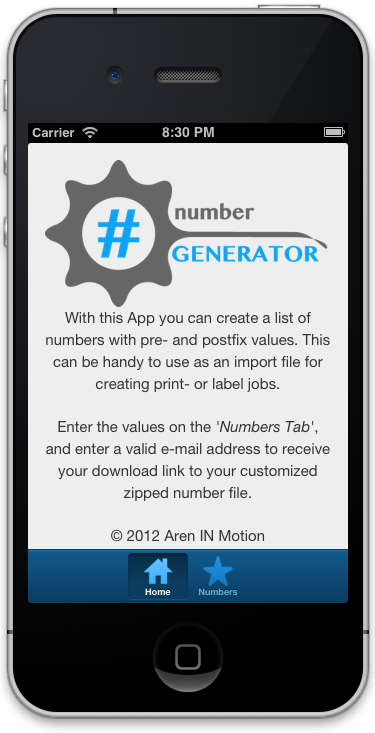 With this App you can generate a range of numbers with pre- and postfixed values. The range may be up to 1.000.000 ( 1 million). The created range file is created on our servers and a download link is mailed to the given e-mail address. 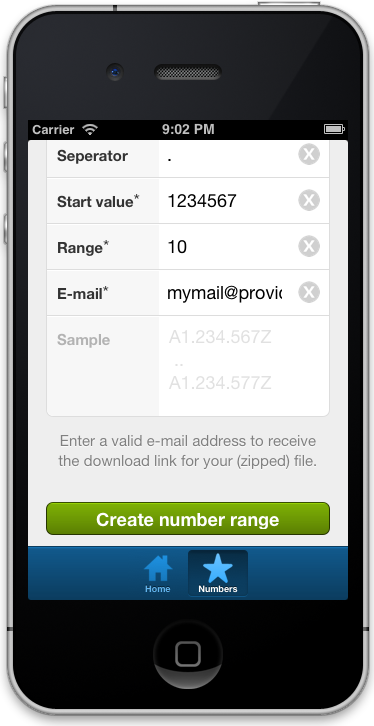 After a submit with ‘Create number range’ you receive your zipped number file in the specified e-mail address. You need to change one of the values to submit the form again.